30-06 M1903 Springfield/ M1 Garand/ Thompson M 1923 Submachine gun. s# 162942. Superb long fullered dark parkerized blade. Maker's name and date; R I A (= Rock Island Arsenal) over 1909 with ordnance bomb on ricasso. US over 162942 on reverse side. Excellent parkerized pommel and crossguard with muzzle ring MRD 16 mm. The mortise slot is marked A (=Alteration) and there is a second serial number A 11740 on the crossguard. Excellent black bakelite ribbed grips secured by a single screw bolt and release catch close to the muzzle ring. Excellent and correct green painted plastic M 1917 scabbard with US Ordnance bomb and wire attachement made by Beckwith Manufacturing Company and marked SN 1-7. Excellent+ example. Hard to improve! First models of the 1905 bayonet had long bright blades. The majority of these blades were shortened during WWII and later they produced a M 1905 with a new short blade. This shortened model and the new made shortened bayonet were called the M 1905 E1 bayonet. 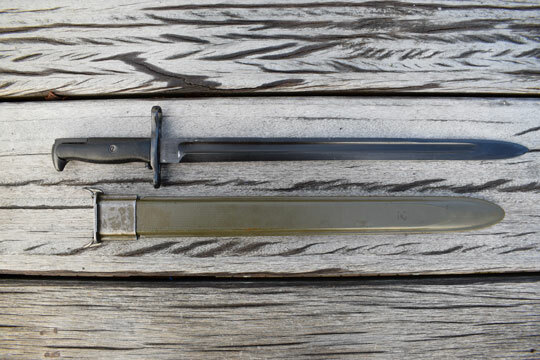 For the Pacific WWII theatre there was a need for a longer blade version to compensate the long Arisaka blade of the Japanese. Since many long bladed bayonet were shortened, a new production run started up in 1942/43 and this new M 1905 bayonet was often called M 1905/42. These entirely parkerized bayonets are marked 1942 or 1943 on the ricasso. In the same period they started to arsenal update the earlier models by replacing the wooden grips for black plastic grips, improve the catch and to parkerize the entire bayonet. It was fitted with a green plastic m 1917 scabbard. This alteration was marked with an A on the mortise slot. So this example is an early M 1905 bayonet, altered and re-used in the Pacific during WWII.